On the ‘Island of the Gods’, healing through both the physical and spiritual is a natural way of life. 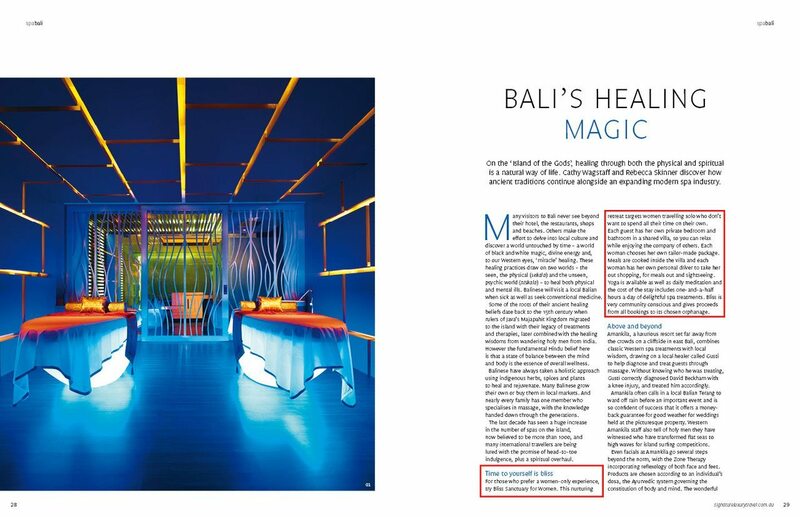 Cathy Wagstaff and Rebecca Skinner discover how Bali’s ancient traditions continue alongside an expanding modern spa industry. Many visitors to Bali never see beyond their hotel, the restaurants, shops and beaches. Others make the effort to delve into local culture and discover a world untouched by time – a world of black and white magic, divine energy and, to our Western eyes, ‘miracle’ healing. These healing practices draw on two worlds – the seen, the physical (sekala) and the unseen, psychic world (niskala) – to heal both physical and mental ills. Balinese will visit a local Balian when sick as well as seek conventional medicine. Some of the roots of their ancient healing beliefs date back to the 15th century when rulers of Java’s Majapahit Kingdom migrated to the island with their legacy of treatments and therapies, later combined with the healing wisdoms from wandering holy men from India. However the fundamental Hindu belief here is that a state of balance between the mind and body is the essence of overall wellness. 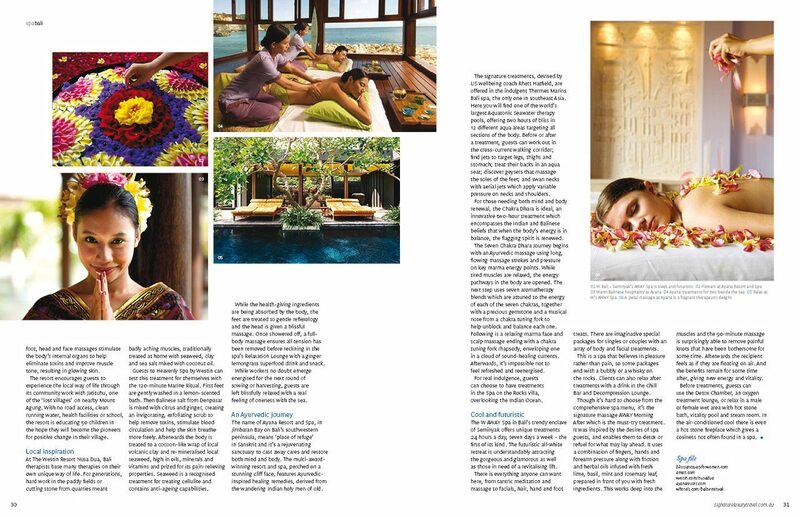 Balinese have always taken a holistic approach using indigenous herbs, spices and plants to heal and rejuvenate. Many Balinese grow their own or buy them in local markets. 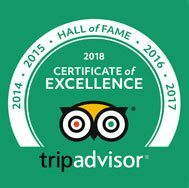 And nearly every family has one member who specialises in massage, with the knowledge handed down through the generations. 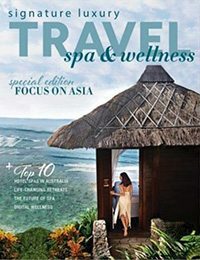 The last decade has seen a huge increase in the number of spas on the island, now believed to be more than 1000, and many international travellers are being lured with the promise of head-to-toe indulgence, plus a spiritual overhaul. For those who prefer a women-only experience, try Bliss Sanctuary For Women. This nurturing retreat targets women travelling solo who don’t want to spend all their time on their own. Each guest has her own private bedroom and bathroom in a shared villa, so you can relax while enjoying the company of others. Each woman chooses her own tailor-made package. Meals are cooked inside the villa and each woman has her own personal driver to take her out shopping, for meals out and sightseeing. Yoga is available as well as daily meditation and the cost of the stay includes one-and-a-half hours a day of delightful spa treatments. Bliss is very community conscious and gives proceeds from all bookings to its chosen orphanage.